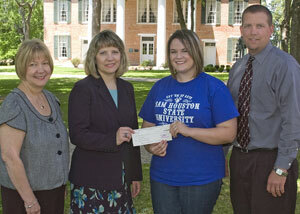 Junior Pamela Saunders (second from right) received $200 for her theme idea, "An Orange STATE of Mind." The 2008 Sam Houston State University homecoming steering committee is hoping Bearkat fans will have "An Orange STATE of Mind" during the week of Oct. 13-18. The winner of the contest was Pamela Saunders, a junior elementary education major from Conroe who was presented with a $200 check for her homecoming theme idea. For the fourth consecutive year students, faculty, staff have had the chance to submit ideas for a homecoming theme. The homecoming steering committee narrowed down nearly 250 submissions to five ideas that were voted on at the Student Government Association elections in early April, according to Cindy Truax, promotions committee chair. For more information, contact Truax at 936.294.4388. Eight dance students will perform a “scandalous” piece from 18th Century Mexico based on the research of a Spanish professor on Monday (May 5). “El Chuchumbé:’ A Scandalous Song and Dance Prohibited by the Mexican Inquisition in the Eighteenth Century” will be held at 3 p.m. in the Recital Hall. Choreographed by dance professor Cindy Gratz and based upon associate professor of Spanish Frieda Koeninger’s on-going research of the Mexican Inquisition, the song, “El Chuchumbé,” was prohibited for about 40 years during the inquisition to no avail, according to Koeninger. Within five years the song, introduced to Veracruz, Mexico, from Havana around 1765, had crossed the country and become popular in Acapulco. “The students have captured the mocking tone of the dance, as well as the spirit of the Mexican people,” Gratz said. The program is co-sponsored by the departments of dance, foreign languages and the School of Music. For more information, contact Koeninger at 936.294.1443. The Sam Houston Writing Center will give student, faculty and community writers and “word-lovers” a forum for their words to be heard during its second informal, after-hours readings session. “Designed to be an encouraging forum for those who want to share their creative works with others,” the “Writing @ the Center” reading will be held on Sunday (May 4), at 8 p.m. at the Writing Center, according Dana Allen, Writing Center consultant and English graduate assistant. The physics department will give its final tours of the “Spring Skies and Hubble Vision” for the semester on Friday (May 9) and May 23. The spring semester will come to a close on Thursday (May 8). There will be no classes on Friday for the final exam study day, with final exams being held May 12-15. The final exam schedule is available online at https://www.shsu.edu/~pin_www/calendars/springfinals.html. Three spring commencement ceremonies will be held May 16-17, with speakers Dirk Van Tuerenhout, anthropology curator at the Houston Museum of Natural Science, and current member of the board of regents Trisha S. Pollard are the speakers. Residence halls will close at noon on May 16 and reopen for the summer sessions on at 11 a.m. on June 2. Classes begin for the first summer session on June 3. The School of Music will end the spring semester with a quartet of concerts beginning Monday (May 5), when the Electronic Music class will present their final projects. The concert, at 7:30 p.m. in the Recital Hall, will feature 11 student works that incorporate electronic music techniques—including sound synthesis, audio sampling, audio editing and mixing—within a full 4.1 surround sound environment, according to Electronic Studio director John Crabtree. Highlighting the concert will be a performance of composer Charles Dodge's "Any Resemblance is Purely Coincidental" by music theory professor Carlo Vincetti Frizzo. “Frizzo will accompany, in a humorous theatrical presentation, an electronic manipulation of a vintage recording of Enrico Caruso as Carnio from the opera, ‘Pagliacci,’” Crabtree said. On Tuesday (May 6), the SHSU Jazz Lab Band, Jazz Ensemble and the student jazz ensemble Artistry in Rhythm will present “An Evening of Jazz,” at 7:30 p.m. in the Lowman Student Center Ballroom. The Jazz Ensemble performance will also feature guest artist Rocky Winslow, who has performed on “The Tonight Show,” was part of the 2000 tour of Japan with The Temptations and The Supremes and backed up Wayne Newton on a number of songs for the “Vegas Vacation” soundtrack. Admission is $10 for adults and children over the age of 6, $5 for senior citizens and SHSU students with an ID and free for children under 6. Other concerts for the week include a Saxophone Studio recital at 7:30 p.m. on Wednesday (May 7) in the Recital Hall, and an honor student recital at 7:30 p.m. on Thursday (May 8) in the Recital Hall. SHSU music alumnus Sean Nelson and his Bell Street Trombone Quartet will return to campus to kick off their Houston tour with a performance on Wednesday (May 7). The quartet, all graduate students from the University of North Texas, will perform baroque, classical and modern styles of music at 6 p.m. in Music Building Room 201. The concert will also feature an original composition by one of the members, Mark Scott, called "Spring Lightning," as well as the quartet’s bass trombonist, Jason Hausback, who recently received first place in the National Solo Contest at the Eastern Trombone Workshop, in Washington, D.C., according to Nelson. The tour is being held in preparation for the International Trombone Association contest at the end of May. “We were one of three groups selected, by recording, to advance to the final round, held at the trombone festival in Salt Lake City, Utah,” Nelson said. Graduating art majors will reveal their paintings, drawings, photography and other pieces in their design portfolios beginning May 12 in the Gaddis Geeslin Gallery. A reception for the Graduating Senior Exhibition will be held on May 16, immediately following Friday’s commencement ceremony, at approximately 8 p.m. The reception is open to the public, and refreshments will be served, according to art department audio/visual librarian Debbie Davenport. The exhibit will feature Bachelor of Fine Arts candidates, who will receive degrees in studio art, graphic design and photography. For more information, call the art department at 936.294.1317 or visit http://gaddisgeeslingallery.blogspot.com/. SHSU will host a public auction on Saturday (May 10) beginning at 8:30 a.m. at the property warehouse in the Sam South Complex, at 2424 Sam Houston Ave. Some auction items include office furniture, televisions, refrigerators, tables, fax machines, chairs, file cabinets, copiers, a welding machine, harpsichord, kiln and an ice machine, among many others. In addition, a 1988 Chevrolet half-ton pickup, a 1989 Ford half-ton pickup, 1992 Chevrolet Astro Van, a 1993 Plymouth Grand Voyager, a 1998 Chevrolet S10 pickup, a 1998 Toyota half-ton pickup and a 2002 Ford Crown Victoria will be auctioned. The Eta Iota Chapter of Pi Delta Phi initiated seven students and three honorary members into the national French honor society during its annual ceremony on Wednesday (April 30). Those inducted include Patrick Bashor, Carey Chartier, Tamera Claunch, Erica Hill, Jessica Holland, Ashton Mouton and Ashlyn Remmert. In addition, assistant professor of French Madalina Akli, professor of Spanish Enrique Mallen and Richard Edwards, sponsor of the Seola Arnaud and R.V. Edwards endowed Scholarship in French, were inducted into Pi Delta Phi as honorary members. To be inducted as a member, students must have taken at least 18 hours of French and maintain an overall grade point average of 3.0, with a “B” average in French. The ceremony was conducted by Eta Iota student president Heather Liner and secretary Jennah Burleson, and attended by local members of the society, family and friends of the initiates. Also welcoming new members were SHSU foreign languages faculty members Debra Andrist, Shirin Edwin, Mary Gutermuth, Frieda Koeninger, Kay Raymond and Rafael Saumell-Munoz. For more information on the organization, contact Gutermuth at fol_meg@shsu.edu or Edwin at see001@shsu.edu or at 936.294.4732. Ten years after adding the counting meter to his online Picasso Project, the Web site has surpassed its five millionth hit. The Picasso Project was created by Spanish professor Enrique Mallen in 1997 as a classroom project to chronicle the art and literary works of the famous Spanish artist. The meter was added a year later, on April 7, 1998, to determine its users’ country of origin, according to Mallen. Since then, the Web site as received approximately 1,370 hits a day worldwide. Users of the Picasso Project have come from a wide range of countries, including the U.S., with 32.4 percent of the users living there; the United Kingdom, with 8.6 percent; Spain, 5.1 percent; Brazil, 4.4 percent; and Canada, 3.3 percent. For more information on the Picasso Project, visit http://picasso.tamu.edu/picasso/.